UV spectroscopy studies performed in our laboratory indicate that passing water through the Vortex Water Revitalizer does result in certain changes in its structure, probably towards the formation of clusters. Furthermore and most interestingly, these changes are observed not only in the water directly treated in the VWR [Vortex Water Revitalizer] but also in the remaining part of the water system previously being in contact with the portion passed through VWR [Vortex Water Revitalizer]. The change in UV spectra of the samples passed through VWR [Vortex Water Revitalizer] are the most significant and the values for the rest of the aqueous system after VWR treatment (e.g. liquid from the flask after a part of its content was treated by VWR) are intermediate between those for the initial liquid before revitalizing and for the directly revitalized part. The most prominent evidence for this fact are obtained using very diluted solutions of benzoic acid since this substance is a highly sensitive indicator for these UV spectroscopy measurements (its solubility and consequently UV absorption / transmission performances strongly depend on the structure of water in which benzoic acid is dissolved). Water is an intrinsically integrated object and revitalizing of even a small part of it, results in a similar but certainly less strong effect in all the water system being a whole before this procedure. Part of the scientific community has researched the abilities of water to carry information in an organized fashion. A decade or more ago, I read an article in some scientific magazine, about the ability of water to store data in an organized manner just like a hard drive on a computer. The article stated that the scientists were anticipating a drop of water to hold vast amounts of data. 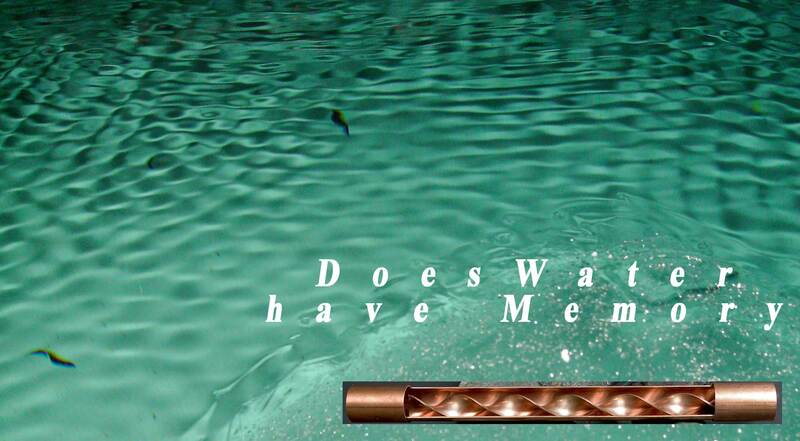 Since then other scientists has researched how to utilize water's 'memory' to provide for further applications. At this moment I will only provide you with the encouragement to google these terms: water's memory, water memory, russian, water as a carrier of information/data etc. You will find both very real research and I am afraid you will find a lot of pseodo research and marketing hype as well. You be the one to discern for yourself. As an indicator of water's abilitiy to hold and recognize information I am sharing this photo with you from a swimming pool that is being treated with the Vortex Water Revitalizer. The structure of the surface water is set into motion by both the water from the incoming jets into the pool as well as the wind which is carressing the surface of the water. Wind by the way is also moving in vortex like swirling movements, which can be seen if you put smoke up in an airfield from which an airplane takes off. You can of course also just observe how autum leaves are swirling around in the wind while falling. If you have a pool I like you to observe how the surface looks like when the wind is blowing on its surface and take photos of it to compare with the photo below. The photo below is to inspire you and I am not making any direct claims. I simply want to trigger the speed of your thought. It looks like the Vortex Water Revitalizer is designed in harmony with the Cosmos we are part of. In the book you will find a photo of the double helix spiral formation of energy emanating from the sun in our local solar system. Dr. Emoto in Japan has done interesting research into how water can be influenced by both sound and written words. The validity of his research should not be based upon the levels of today's science. It should be looked upon as a doorway into the deeper nature of water. One of his books is called: 'Love thyself'. Google it. Once you read it, you will understand its title. If you are a scientist and you have access to research facilities in any area related to water, I ask of you to contact me. For one, I can imagine university students, who would be happy to explore the astonishing aspects of water's behaviour reflected in how we treat it. How do you as a scientist think water will respond to be treated with a compressed but natural process of vortex induced implosion?